For Q4 2017, we've analyzed over 1.7 billion Facebook ad impressions across 1700+ unique accounts in US currency to uncover the average CPM, CPC, and CTR. Compared to Q3'17, we found the average CPM for Facebook ads increased by 37%, the average CPC for Facebook ads increased by 14%, and the average CTR for Facebook ads increased by 25%. 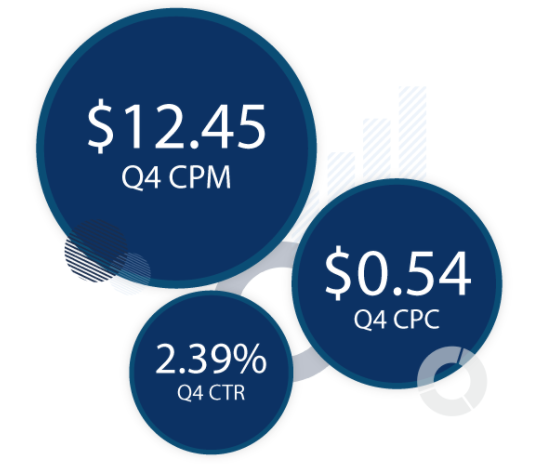 Based on AdStage data, Facebook Ad CPM increased by 37% from $9.06 in Q3 to $12.45 in Q4. The 2017 trend shows that Facebook Ad CPM increased 110% from $5.93 to $12.45 comparing Q1 to Q4. Facebook CPC increased 14% in Q4 to an overall average of $0.54. The 2017 trend shows that Facebook CPC increased 109% from Q1 to Q4. Facebook advertisers saw a positive CTR increase of 24% from 1.92% in Q3 to 2.39% in Q4. The 2017 trend shows that Facebook CTR increased in Q4, recovering from mid-year lower average CTRs. Year over year CTRs are relatively flat at -2%. In Q4, we analyzed over 268 million Facebook Audience Network ad impressions. Compared to Q3'17, the average CPM on Facebook Audience Network decreased 8%, the average CPC on Facebook Audience Network decreased 4%, and the average CTR for Facebook Audience Network decreased 5%. Based on AdStage data, FAN CPMs decreased by 8% from $4.08 in Q3 to $3.77 in Q4. The 2017 trend shows that Facebook Audience Network CPM increased 14% from $3.32 to $3.77 comparing Q1 to Q4. 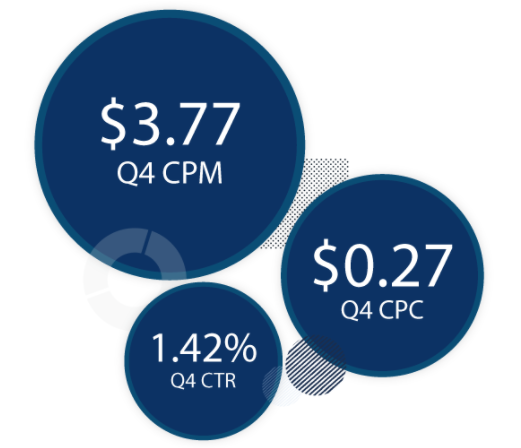 Advertisers are getting a consistent CTR from Q3 to Q4 with only a minor decrease from 1.49% to 1.42%. The 2017 trend shows that CTR has dropped 47% from 2.68% to 1.42% comparing Q1 to Q4. There were three factors that are worth calling out as they relate to Facebook ad results. According to Facebook's Q4 earning call, the network made algorithm tweaks resulting in a 5% drop in the total amount of time users spent on the social network. Facebook also reported its first-ever decline in daily users in the U.S. and Canada. In Q3 the network had 185 million daily users in this region and in Q4 it dropped down to 184 million. Lastly, the number of Facebook advertisers grew to over six million at the end September 2017. That's over 1 million new advertisers from March 2017. Based on that growth plus the holiday season, we can surmise that Facebook added more advertisers in Q4. Take these three factors together and it's easy to see why the ads auction is so competitive and further illustrates Facebook's ad load capacity is maxed out. That said, the results must be positive as budgets on the social network saw a 26% increase in Q4 compared to Q3 according to AdStage data. Looking forward into 2018, Facebook will play a bigger role in paid marketer’s mobile strategy. I predict Facebook marketers will turn to Instagram ads to drive conversions, experiment with Messenger ads to start conversations, and turn to offline conversions to measure business impact. Check out expert Facebook predictions for 2018. Get the Q1 2018 Paid Search and Paid Social ads Benchmark Report for the latest trends across all major ad networks.